Home / The Archives / Coolest thing Ever! Now it’s a tandem, now it’s not! Welcome to the innovative world of the CycleMorph Tandem Adapter. Why limit yourself? Turn your mountain, hybrid, or multiple-speed comfort bike into a CycleMorph tandem bicycle, and you’ll have the best of both worlds-â‚¬ single AND tandem. 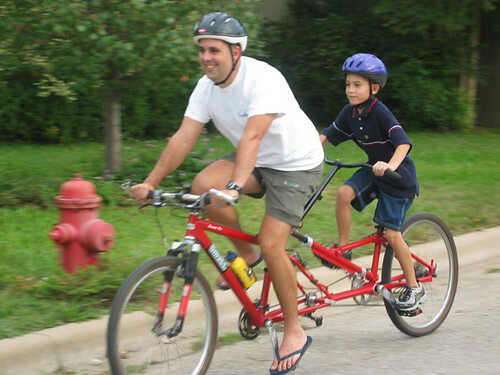 The CycleMorph Tandem Adapter lets you go back and forth between single and tandem bicycle in 10 minutes or less, with no tools. It simply attaches to the rear of your bike at the seat post and rear dropouts with quick releases. Whether you ride for pure pleasure or for physical fitness, with a spouse, child or friend, the CycleMorph tandem bicycle is the perfect part time bicycle built for two. Rider or dealer, parent, relative or friend of a person with disabilities, we invite you to read more about our product and us. Where can you buy a CycleMorph Tandem Adapter?